Going to Russia, especially to its capital city Moscow, even though you will not buy anything. As a tourist, it is also alright to just walk and window shopping in the mall. you could feel a different environment than in your home country. Also going to their shopping outlet which famous as 8 most exclusive shopping outlet in Moscow, will make for better experience on the trips. How the clothing trends are different than your home country. Also, there are a few good reasons to visit places you never visit in another country, especially for Russia which have many cultures. The shopping outlet here also will be a bit different from other cities, like Sochi or St. Petersburg. When you go shopping the first thing you need is a list of things and souvenirs to buy, whether for your kids who can’t come or other people. Also, if you want to travel to other places in Russia, like said going to some cold places in Russia, buy it in Moscow, so you could get a recommended items for your traveling purpose. Although maybe if you are traveling on a budget, you should limit your budget, there is also a guide if you ever plan to go to Russia on a low budget. Moscow as the capital city, like many other capitals in the world obviously, will have many products from local places in Russia. And, even though buying in its town origin will have different meaning and quality, we all know, we dont have time to visit all of the places just to buy souvenirs and exclusive item. But to find the shop exclusive to its niche, you will have a hard time if you can’t speak the Russian language, which you should learn from now on. Many people in Russia is welcoming towards a tourist but if you can’t speak Russia, you also shouldn’t expect them to understand English which is not their native language. But don’t worry, I will provide you with a guide in here. 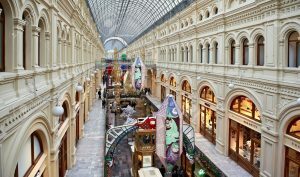 It will serve as your list of the 8 most exclusive shopping outlet in Moscow serving as a choice to go shopping in Moscow. Whether you buy it or not, it will also depend on your taste and preferences and lastly your budget. You couldn’t hate what Russian people could offer you with their things. Almost everything is worth buying and it will suit your taste. So here is the list of 8 most exclusive shopping outlet in Moscow. When I heard of this outlet, my mind is going like “What the…?” why it had a funny name for a shopping outlet. but don’t get it wrong, GUM is the well-known mall in the city of Moscow. It is due to the 19th century architectural style, it looks like a royal palace and indeed offers an experience that’s no less than royalty-like. With fashion brands like Dolce & Gabbana, for a fashionista, I think you will like this places. What more you did get some nice experience how it feels to shopping in the 19th century ago. You could go there in the morning or night but not before 10.00 PM. In Indonesia, you might find something like this in Bandung, its called Jalan Dago in Bandung. Russia as one of the biggest countries, also have a famous and well known street in Moscow its capital. Situated in the historical center of the city you will find many classy souvenirs to elegant stores in there which is also cheap. So every souvenirs and store that might not be in GUM, you could at least try this place if not also to enjoy experiencing shopping in Russian street. It is closed more early than GUM in which it is 9 P.M. If you are a gemstone enthusiast, you should probably go here to find a unique gem from Russia. Tverskaya is among the most famous shopping street in Moscow for its gem and jewelry here. You could find mid end to luxury store here, but beware of your budget, you don’t want to splurge more than a hundred bucks here. Flacon once is known for it perfume production, but now it is also the best time to spend time shopping and do many others thing here. Not only it provides you with any kind of clothing shop, local items, but it also has fair in here. In which not only you could browse their item, but you also could catch a sight of their culture and tradition. What’s more incredible thing is, Flacon is open 24 hours a day. If you were a book addict or had interest in literature, you might try Kuznetsky Most to search for a quality book there. It is known for its bookstore, which means probably you could find most of the good literature here. Also because not only books, they also famous for its boutique which have a different style from another shop. Don’t forget to buy some trendy accessories here for your souvenirs and maybe one or two apparel. Also a street market, Izmailovo offer you different kind of things to browse there. While at it, Izmailovo market is known to offer you best deal for art and antiquity you could find around Moscow, which also means that this is the best places to finds some cheap souvenirs that are budget friendly. This market street is located in the east of Kremlin, as one of the oldest trading areas of Moscow, Surrounded by a wall from medieval age also make this place is more interesting to go. Also, a few unusual stores could be found in there, one of them is the art boutiques in Ulitsa Varvarka churches. You also could browse fine handicrafts, jewelry, a selection of native Russian art while at it. And that is the reason I include it in my 8 most exclusive shopping outlet in Moscow list. Yes, this is a museum, but not an ordinary museum. In here you could learn about Russian history of vodka and what more, also tasting it a bit. Vodka is an alcoholic drink which I know some people don’t drink it, but it’s never wrong to buy it to someone as a souvenir. Cristall Vodka Museum is not a shop, so you cant buy it there. but the store nearby sells it the same thing which you could see in the museum. Alright, that’s all the 8 most exclusive shopping outlet in Moscow, which have just one mall on the list. Well, if you want to go to the mall window shopping its alright. But, if you want to buy some Russian exclusive things, there are no better places than shopping street. Just a bit of suggestion, whatever you buy don’t ever forget matryoshka doll. Enjoy your trips.